I have to side with @zombie . If America was part of the catholic religion then I would I say so but we are mostly protestant. @zombie in order for Mecca to be Babylon you will need to identify who are the Israelites living in Mecca and show me history of who was taken on ships and enslaved in Mecca? As you see in the scripture below the Israelites would be oppressed by another people. Blacks were taken to America on ships to fulfill Deuteronomy28:68 and blacks are oppressed in America/Babylon and most anywhere they go..
As you see in the scripture below the Israelites living in Babylon will be ruling over there oppressors in the future so show me who are the Israelites in Mecca being oppressed? 14 For the Lord will have mercy on Jacob, and will yet choose Israel, and set them in their own land: and the strangers shall be joined with them, and they shall cleave to the house of Jacob. 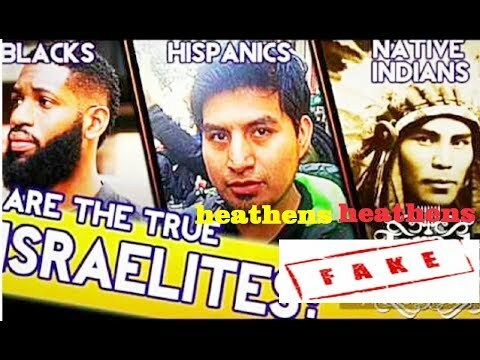 Listen to me very closely @beenwize hebrew israelite ideology is wrong black people i.e black people in the americas are not the genetic descendants of the israel spoken of in the bible. I broke down why deut 28 does not apply to black people and america in another thread if you want me to I can do it again here. B.h.I are liars and twisters of history and the bible. I just asked you to show me who are the Israelites being oppressed in Mecca? Show me them enslaved oppressed in Mecca after being taken captive there on ships? Deut 28:68 was fullfilled by the roman empire and their destruction of and ensavement of juda and isa 14: 1-6 is about the babylonian captivity in ancient babylon not the evil nation of the future from our perspective, that will be associated with end times babylon. Lol keep reading isiaiah 14. It is referring to the end times Babylon. You are being deceitful. I refuse to believe you are that far offthe mark. Lucifer was destroyed in ancient Babylon12 How art thou fallen from heaven, O Lucifer, son of the morning! how art thou cut down to the ground, which didst weaken the nations! Was Lucifer destroyed in ancient Babylon as well? Who mentioned Satan... My question stands. what question is that?? you used isa 14: 1-6 and deut 28 to prove what point??? you confused me by bringing them up because they have nothing to do with the babylon of end times in what i believe to be the proper interpretation of prophecy. And who israel is, has nothing to do with race as being an israelite today is about your faith especially today since the new covenant rules how god deals with people and yes their are jews and christians that live in saudi arabia. Could a mere city rule the world today without a large, major country behind it? Of course, not. As it turns out, other details point to Babylon as a chief city of a “nation” (Jer 50:12) with farmland (Jer 50:16), and other cities (Jer 50:32; 51:43). Then why does Revelation call it a city? It seems to be using a common convention in both ancient and modern times to refer to a nation by its chief city. The media today often uses Moscow or Washington to refer to Russia or USA, respectively. Shouldn't the prophecy refer to Washington, then? Washington may be America's capital, but New York City is America's biggest and most important city for commerce, finance, advertising, etc. It is more distinctive. It is not so strange that a prophecy about America identifies her by her greatest and most distinctive city. "This is the word the Lord spoke through Jeremiah the prophet concerning Babylon and the land of the Babylonians"
Is nyc or washington a dessert of the sea??? are they in a wilderness?? no therefore they cannot be babylon. Mecca and Islam have nothing to do with Babylon the Great. The people of God live inside Babylon the Great! That is why God calls His people to come out of Babylon the Great! how many Christians live in Mecca? This is so foolish it's insane. And you are not following the prescription God has laid out for understanding doctrine. So this conversation is useless unless you start doing things Gods way and not your way. Go line upon line, precept upon precept, here a little and there a little. Leaving a global system of any kind does not protect you when fire is falling on the land. Just ask the people who lived in Sodom and Gomorrah—which Babylon's destruction is compared to (Jer 50:40). Lot had to physically leave Sodom to be safe from her fiery judgment. If Lot had stayed in Sodom to witness to the Sodomites, he would have been a crisp no matter how righteous he was because he disobeyed instructions. The righteous will also be physically fleeing Babylon in the future, just as Lot physically fled Sodom.